Asus motherboard P8H67-M supports the latest Intel Core i7, Intel Core i5, Intel Core i3, there are 4 slots, dual-channel DDR3 memory architecture, supports up to 32 GB. Modern Intel H67 supports SATA interface at speeds up to 6 Gb/with. Onboard audio Realtek ALC892. Dimensions 24.5 cm x 24.5 cm. 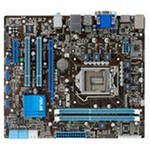 Excellent motherboard to upgrade your computer.